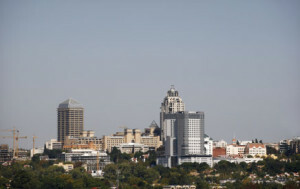 If Sandton’s CBD were not already a draw card for business, then the added advantage of the Gautrain is a real positive. This directly links the Sandton CBD with Oliver Tambo Airport, making it that much easier for local businessmen and international visitors to effortlessly travel from the airport into Sandton. New office developments, retail and hotel developments have already started mushrooming close to the anticipated Gautrain terminus. The bus rapid transport system (Rea Vaya), which hopes to replace the use of private cars as much as possible in Johannesburg, will interchange with the Gautrain at Sandton (it will also do so at Rosebank and Park Station, in the city centre). The result of all of this added development means that Sandton CBD is now more than prime real estate country; it is arguably the place to stay if you are in Johannesburg for business or pleasure, for Sandton is also the ‘shop ’til you drop’ Mecca of the city, and more shops, boutiques and hoteles in Sandton in one place will be difficult to find. Night life is spiced with an array of restaurants, both in the major shopping malls and surrounds, and there is a theatre on the square, diagonally opposite the statue of Nelson Mandela.